I never personally knew my grandfather, but from what I have heard when my grandmother spoke of him, he was the “bee's knees." Theirs, to me, was a true love. 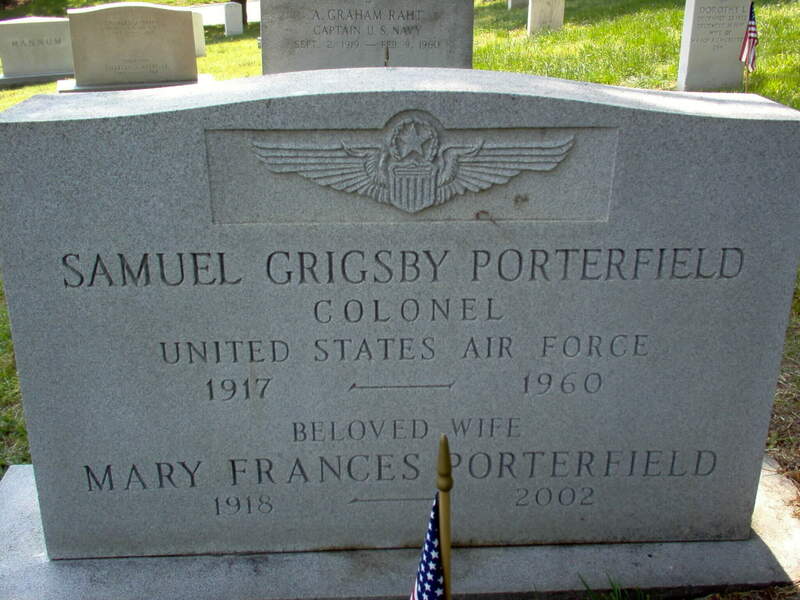 Samuel Grisby Porterfield was born to Clyde and Ada Porterfield on August 19, 1917 in Oakdale, Louisiana. He attended Ouachita Baptist College in Arkadelphia, Arkansas from 1935 to 1939, and graduated with a BA in Social Science. When he graduated, he joined the Army Air Corps that later became the United States Air Force. 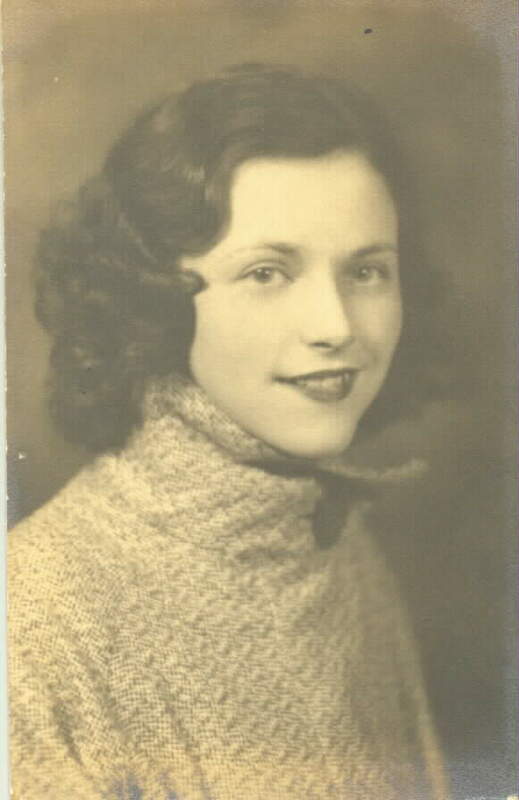 He married my grandmother, Mary France Pate, and they immediately moved to California, where soon afterwards my Uncle Don was born. 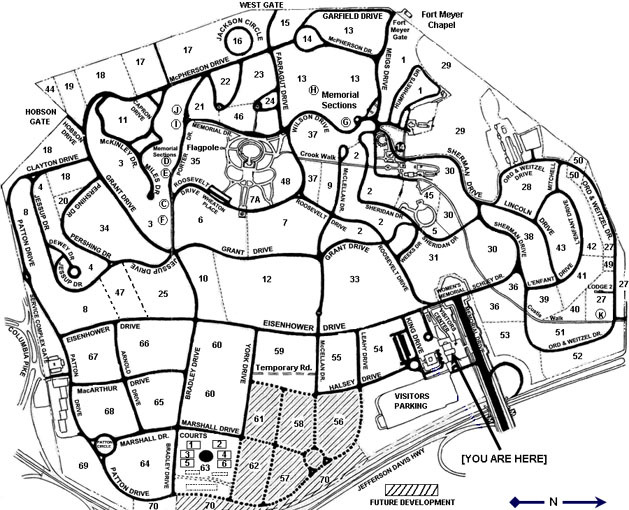 Approxiamtely four years later they moved to Hickam Air Force Base, Hawaii, where my mother, Becky, was born. The family went on to be stationed in Kwajelein, Albuquerque, New Mexico, Shreveport, Louisiana and Maxwell Air Froce Base in Montgomery, Alabama. He was only supposed to be there for one year, but he made such an impression that they asked him to stay on the faculty at the Air War College. 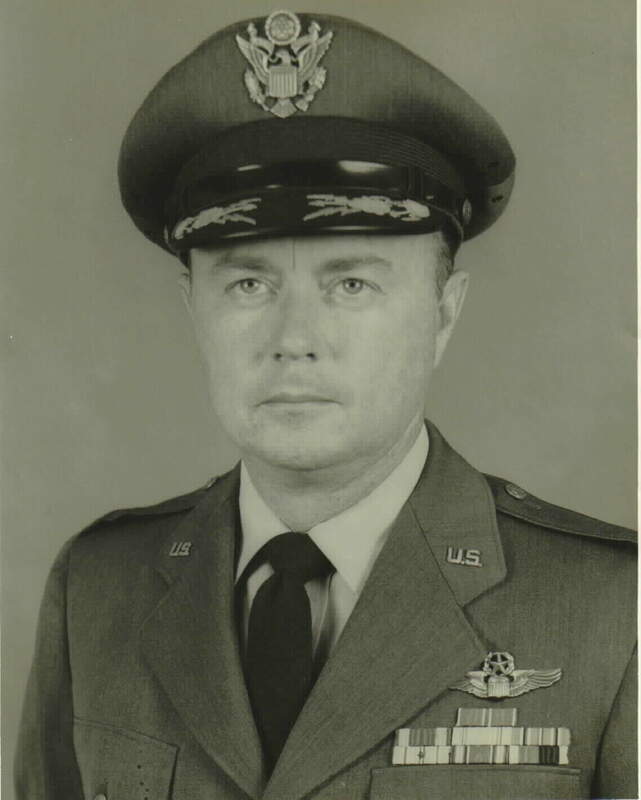 They then moved to Ramey Air Force Base in Puerto Rico, where Samuel was now a Colonel and Deputy Commander of the Wing. He and all the crew members were killed when their B-52 developed engine troubles and crashed at the base on February 1, 1960. I only wish I had known him. My Grandmother never remarried, and was always very much in love with him. Trouble won't, trouble you now that I'm here. Trust me to love you and help you to grow. These are lines from one of my favorite childhood movies, and also happens to be part of what Mary Frances meant to me. She was a grandmother, mother, wife, sister, and friend to all. Born to Jasper and Pearl(Logan) Pate in Glenwood, Arkansas, the baby sister to Hazel and Grady. She soon met her true love, Samuel Grisby Porterfield, at Glenwood High School. She even went on to graduate in three years time, with a BM degree in music instrumental from Henderson State Teacher’s College in Arkadelphia, Arkansas so that she could go ahead and marry her high school sweetheart, as he was one year ahead of her in school. 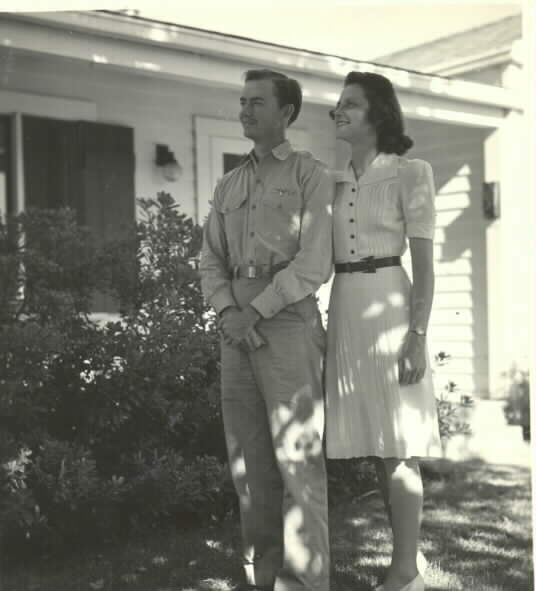 After their wedding day, June 8, 1941, they moved immediately to California, as Samuel had joined the Army Air Corps, and her mother thought she was going to the end of the earth, all the way from Arkansas! Mary Frances got so homesick that she and Samuel would drive all night and day to get back to the south for a visit, many times, and mind you there were no interstate highways at that time. In June of 1943, Samuel Don Porterfield was born, and soon after this young family moved to Colorado Springs, Colorado and they fell in love with the area. Her husband was ordered to go to war in Okinawa, and once he returned, they had to move along again to Hickam Air Force Base in Hawaii, where Rebecca Sue was born in 1947. The family then was stationed in Kwajelein Atoll - an island in the Marshall Islands in the Pacific, where they lived for nine months. This island was only 11 miles long and they lived on a quonset hut right on the beach. Mary Frances said she got so tired of hearing the surf crash on the shore that she’d wish it would stop if only for a minute! The family would go on to move to different bases in Albuquerque, New Mexico, Shreveport, Lousiana, Montgomery, Alabama, then Ramey Air Force Base in Puerto Rico. 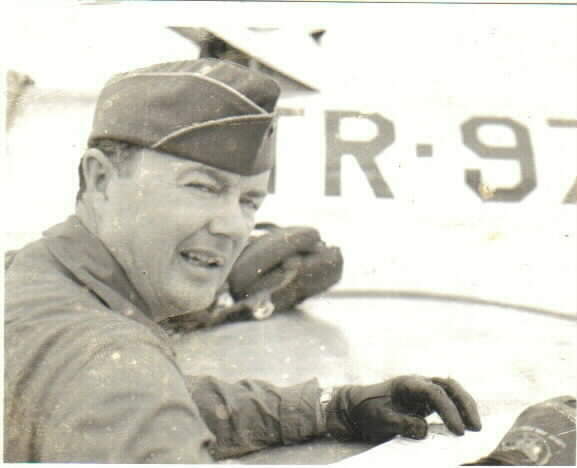 Then, tragically, her husband Samuel, was killed when his B-52 crashed on February 1, 1960. During this period of heartbreak, she gathered strength from her children and moved back to Montgomery, where she would support and raise them - a trying task for a widowed woman in196Os Alabama. She became very involved in all aspects of community: Executive Director, South Central Alabama Council, Girl Scouts, as well as troop leader and trainer; received the Thanks Badge in 1960, and Girl Scout Statuette in 1965; assisted the choir at First Methodist Church; active member of Officer’s Wives Club and Altrusa. She also worked at The United Way and the Montgomery Mental Health Authority for several years. 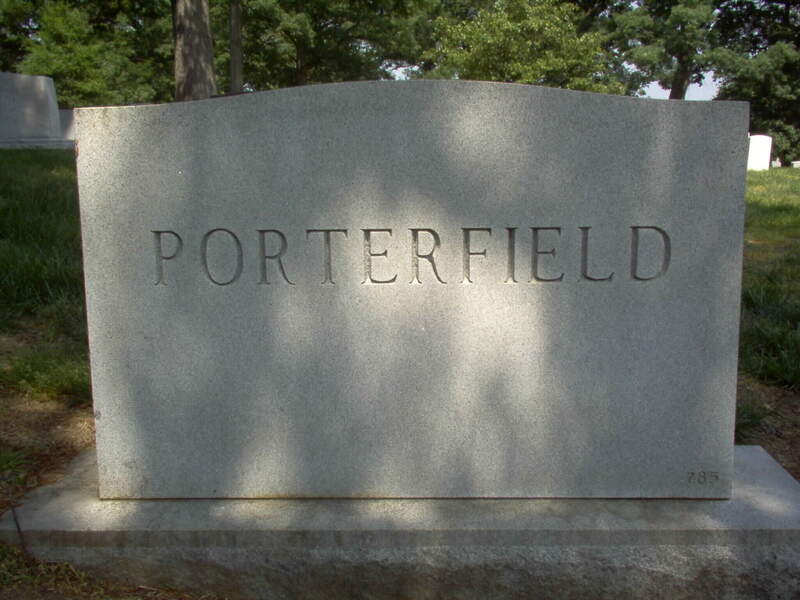 She went on to raise four grandchildren: Jennifer and Susan Blake, and Karen (Kearns) and Sam Porterfield.